Now, you have to remember that when a group of Mancunian heroes visit Merseyside they don’t usually get the best of receptions! The Courteneers, however, tell a very different story. They have been the 'hot buzz' band in the North-West over the last 12 months. Manchester fell quite easily - they've been selling out venues there for months, but now they have sold out Liverpool's Academy 1 in the enemy's town down the M62. So will they live up to the hype and expectation in another of the country's indie capitals? The reception when they hit the stage is rapturous and the opener 'Aftershow' gets the place moving early. Second single but strangely left off the album (unless you look hard) 'Acrylic' takes it to another level! 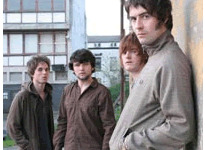 Frontman Liam Fray lets the music do the talking and only interacts now and again, a little surprising considering his reputation of saying what he thinks. The music talks loudly though 'Bide Your Time', with 'Fallowfield Hillbilly' the pick amongst the feverish crowd. Finishing with singles 'Not Nineteen Forever' and 'What Took You So Long? ', the crowd are in the hands of the tall, imposing frontman and sing back as hard as they can. This may be enemy territory but the Mancs are definitely the kings tonight.